How is the haircut "cascade" from the "ladder"
Haircut ladder is one of the most popular women's haircuts. In each season it remains in fashion or otherwise transformed under current trends. That's why hairdressers all over the world have that technique perfectly, despite the fact that this haircut is one of the most difficult in the art of hairdressing. As a rule, it is recommended to owners of thick or unruly hair. Also, this haircut is good if you want to hide any flaws of your hair. Carefully divide your hair into 5 groups: area, Bang, two occipital area and two temporal sides of the head. Secure them to the special Bobby pins clips. Start a haircut with one of the occipital areas better with the one that is closest to you. Pull the hair up towards you and straighten edges. The bottom strand will be the main act for later, you will cut the rest in this area. Cutting subsequent strands occipital areas of need in the radial partings, pulling them to the main strands so as to create an elongation to the face. Try to hold the scissors directly to hair trimming was neat. Getting started cutting the hair of the temporal area, tighten them to the Central parting and cut at the right angle, pulling them towards the top of the head. To navigate you need at the length specified earlier, and to continue to create the elongation to the face. 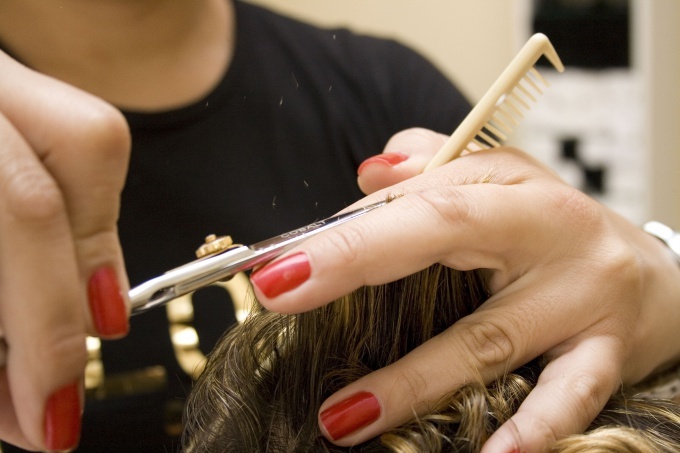 Unnecessary while strands can also be removed with the help of pins. After the haircut, comb your hair, better comb with small teeth, it will allow you to carefully reconcile the deficiencies and time to correct. The strand in the area of the bangs also cut at right angles. Try to do it as evenly and gently, focusing on the suitable for this type of face shape bangs. If bangs are not needed, skip this step. Then all the hair the Central part with radial partings pull to the control strands and podavlivaya them. At the end of the haircut, then align it by applying the Poynting and slicing, when the special scissors with jagged blades edge is trimming to the edge of the staircase was not sharp and clear. This will create a smooth transition from one level to another and add volume to the hair. Once again carefully comb the hair. Make styling with a hair dryer and a round brush, creating the desired amount of hair. Curling hair can be both at the internal side, and external. Shake your head after drying, the hair lay down naturally.